NL-3584 CM Utrecht, The Netherlands. Reasons for performing study: Conformational traits are important in breeding, since they may be indicative for performance ability and susceptibility to injuries. Objectives: To study whether certain desired conformational traits of foals are related to lateralised behaviour while foraging and to the development of uneven feet. Methods: Twenty-four Warmblood foals, born and raised at the same location, were studied for a year. Foraging behaviour was observed by means of weekly 10 min scan-sampling for 8 h. A preference test (PT) was developed to serve as a standardised tool to determine laterality. The foals were evaluated at age 3, 15, 27 and 55 weeks. The PT and distal limb conformation were used to study the relation between overall body conformation, laterality and the development of uneven feet. Pressure measurements were used to determine the loading patterns under the feet. Results: About 50% of the foals developed a significant preference to protract the same limb systematically while grazing, which resulted in uneven feet and subsequently uneven loading patterns. Foals with relatively long limbs and small heads were predisposed to develop laterality and, consequently unevenness. Conclusions: Conformational traits may stimulate the development of laterality and therefore indirectly cause uneven feet. 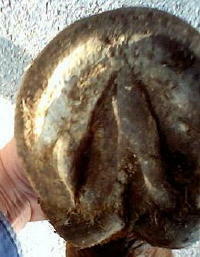 For an illustration, please see this case of a club-footed 9-month old filly, posted earlier here. It is possible to correct a pigeon toed stance with proper trimming. 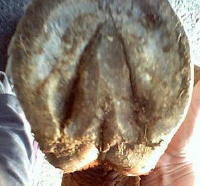 Here the horse has been trimmed once or twice and still shows the pigeon-toed stance. 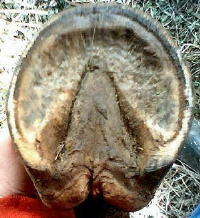 The inside toes have been lowered to initiate the correction. As a result, the hairlines are sloping down on the insides (medial side). 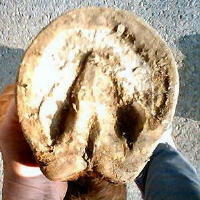 Shown here are the horse’s front feet. Based on the trim and balance of the two front feet, how would you expect the horse to stand?